"I'm going to go with 'not to be.' Final answer." If you recognized the quotation above as from the pen of the immortal Bard of Avon, William Shakespeare, you are indeed correct, sir. If on the other hand, you identified it as a quote from the pen of, say, Henry Miller, don’t ever think of going on Jeopardy. Or Millionaire. William Shakespeare, the immortal Bard, is recognized as the greatest playwright and poet the English language has ever known! Actually that sounds more impressive than it actually is. The English language has always been pretty much of a loner who frankly never knew all that many people, let alone hoity-toity poets and playwrights. So you’d have to have gone to a birthday party for the English language to see if anybody showed up who was serious competition for Shakespeare. Did the English language even know Henry Miller? Still, we can all agree that this Shakespeare guy was pretty good. 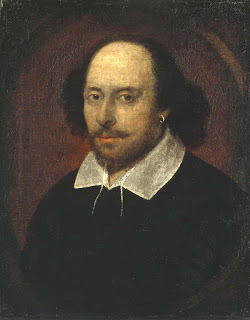 In his scant 52 years of life, he authored some of the world’s greatest plays: Hamlet, Romeo and Juliet, Othello …. umm, umm …. did I mention Hamlet? But pay it no heed. To honor the man himself, we bring you a passel of passages (actually only two) from his most rib ticklin’ o’ works. So scorn not Will Shakespeare. In fact, please give it up for him! From The Merchant of Venice, Act III, Scene I. As spoken by Shylock the Jew. “Hath not a Jew eyes?” ~ I hath, but they’re sunken and deep set and badly in need of an eye job. “Hath not a Jew hands, organs, dimensions, senses, affections, passions?” ~ I hath at least 2 out of 6! “Fed with the same food, hurt with the same weapons?” ~ Between the two of these, I'd go with the one where you get corned beef. “Subject to the same diseases?” ~ And me even more so, because I’m a hypochondriac! “Healed by the same means?” ~ You mean you go to Dr. Schwartzman too? “Warmed and cooled by the same winter and summer?” ~ Yeah, true, but we’re probably not vacationing at the same spots. “If you prick us, do we not bleed?” ~ That's okay, no need to prick me to check this out. Hey, don't you prick me, you prick! “If you tickle us, do we not laugh?” ~ Ha! Ha! Ha! Ha! Oh you great big crazy gentile cutie pie, stop it!! “If you poison us, do we not die?” ~ Again, really appreciate your offer but no demonstration necessary! “And if you wrong us, shall we not revenge?” ~ You betcha! Meet my good friend Mel Hirschman, Head of the Gentile Auditing Division of the United States Internal Revenue Service! Got a desk for him to work at? From Julius Caesar, roaming at random. As spoken by Caesar and Mark Antony. Mark them well! "Let me have men about me that are fat." ~ Governor Chris Christie? I said 'men who are fat,' not the great globe itself! "Yon Cassius has a lean and hungry look." ~ Yon Cassius hath no doubt just come from either Olive Garden or Applebee's. No wonder he's starved! "O, pardon me, thou bleeding piece of earth ..." ~ Bleeding piece of earth? You might want to think about changing gardeners. "And Caesar's spirit ranging for revenge, with Ate by his side come hot from Hell!" ~ Ate by his side? Actually we're thinking Ate might get his own show instead of staying on as Caesar's sidekick. "Friends, Romans, and Countrymen, lend me your ears!” ~ I promise to give them back but not before sticking them in my mouth, just like when I borrow a pencil. “Did this in Caesar seem ambitious? Ambition should be made of sterner stuff.” ~ And in fact, right now, we’re showing marvelous results with Teflon! “This was the noblest Roman of them all!” ~ But the one and only Chairman of the Board, ladies and gentleman, is still .... MR. FRANK SINATRA! And that's it! I hope you’ve enjoyed getting up close and personal with the immortal Bard of Avon. Frankly, the guy’s one hell of a straight man! Of course I had to come right over and read all this. If only the nuns at prison...er...school had allowed us to put our hands on Shakespeare in this manner. Quite hilarious you are! "From the crown of his head to the sole of his foot, he is all mirth." "Well .... maybe 70-75% mirth, for the remaining 30-25% of his crown to foot ratio doth bomb." Thank you for your support, Marisa! That means a great deal, but especially coming from a writer such as yourself. Folks, this woman can really write, so all three of you, PLEASE check her out! This was great!I have a new appreciation of the Shakesdude now. I've posted your web address on my Facebook page and encouraged my feeps to read your blog. Hope you don't mind. Namely there's no way in hell one guy wrote all these plays! Neil Simon didn't write half so many and he's a Jew! No, it couldn't have been one dude. It had to have been one woman. My candidate for authorship of the Shakespeare plays --- Nora Ephron. I believe history will bear me out. As for your encouraging others to read this blog, probably that means more followers, more success, more fame, and boatloads more money. I suppose I don't mind.